Georgy Timofeyevich Beregovoy (Russian : Гео́ргий Тимофе́евич Берегово́й, Ukrainian : Гео́ргій Тимофі́йович Берегови́й; April 15, 1921 – June 30, 1995) was a Soviet cosmonaut who commanded the space mission Soyuz 3 in 1968. 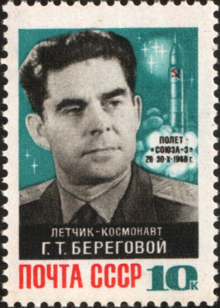 At the time of his flight, Beregovoy was 47 years of age: he was the earliest-born human to go to orbit, being born three months and three days earlier than the second earliest-born man in orbit – John Glenn, but later than X-15 pilot Joe Walker who made 2 (or 3, according to USAF definition) suborbital space flights. The Voskhod programme was the second Soviet human spaceflight project. Two one-day manned missions were flown using the Voskhod spacecraft and rocket, one in 1964 and one in 1965, and two dogs flew on a 22-day mission in 1966. On October 25, 1968, Beregovoy took the Soyuz 3 into outer space: he orbited the Earth for almost four days at altitude up to 252 km. As part of his mission, Beregovoy twice maneuvered his craft into rendezvous positions with the unmanned Soyuz 2 satellite  but was unable to establish a direct physical link to the craft  before returning on October 30, 1968. 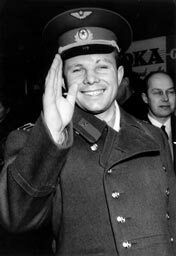 Nonetheless, Beregovoy's flight was in some ways an encouraging success for the Soviet manned space program,  and the colonel was celebrated as a hero upon his return. Soyuz 3 was Beregovoy's only spaceflight and soon after it he retired from active duty, having been promoted to Major General. Boris Borisovich Yegorov was a Soviet physician-cosmonaut who became the first physician to make a space flight. Soyuz 3 was a spaceflight mission launched by the Soviet Union on 26 October 1968. Flown by Georgy Beregovoy, the Soyuz 7K-OK spacecraft completed 81 orbits over four days. The 47-year-old Beregovoy was a decorated World War II flying ace and the oldest person to go into space up to that time. The mission achieved the first Russian space rendezvous with the unmanned Soyuz 2, but failed to achieve a planned docking of the two craft. 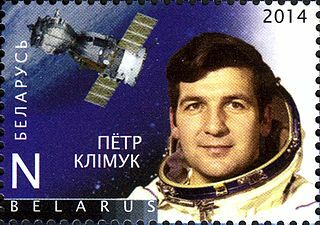 Pyotr Ilyich Klimuk is a former Soviet cosmonaut and the first Belarusian to perform space travel. Klimuk made three flights into space. Aleksei Aleksandrovich Gubarev was a Soviet cosmonaut who flew on two space flights: Soyuz 17 and Soyuz 28. Vladimir Georgiyevich Titov is a retired Russian Air Force Colonel and former cosmonaut. He has participated in four spaceflight missions. The catastrophic explosion of a Soyuz rocket in 1983 led to him being one of only four people to use a launch escape system. He is married to Alexandra Kozlova, they have two children. Aleksandr Aleksandrovich Volkov is a retired Russian cosmonaut. He is a veteran of 3 space flights, including twice to the Mir Soviet space station, and is the father of cosmonaut Sergey Volkov. Igor Petrovich Volk was a cosmonaut and test pilot in the Soviet Union. Yury Nikolayevich Glazkov was a Soviet Air Force officer and a cosmonaut. Glazkov held the rank of major general in the Russian Air Force. Nikolai Petrovich Kamanin was a Soviet aviator, awarded the title of Hero of the Soviet Union in 1934 for the rescue of SS Chelyuskin crew from an improvised airfield on the frozen surface of the Chukchi Sea near Kolyuchin Island. The honorary title Pilot-Cosmonaut of the USSR was a state award of the Soviet Union presented to all cosmonauts who flew for the Soviet Space Agency. 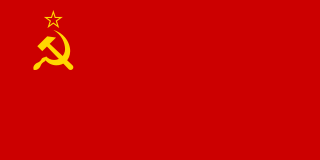 Usually accompanying the distinction was the title of Hero of the Soviet Union, the highest title that could be awarded to a Soviet citizen for performing heroic deeds while in service of the state. Wikimedia Commons has media related to Georgy Beregovoy . ↑ Clark, Philip (1988); The Soviet Manned Space Program; Orion (Crown Publ. ), NY; ISBN 0-517-56954-X. p. 182, "Appendix 3: Cosmonaut Data"
↑ Clark (1988). p. 182: "This mission was cancelled in late 1965; it is uncertain whether Beregovoy would have been the back-up pilot or commander for Voskhod 3." ↑ Clark (1988). See p.49-50: "The initial orbital altitude was announced as 205-225km.... [A] further rendezvous between Soyuz 2 and Soyuz 3 was completed. ... the orbital altudes were announced as: Soyuz 2, 181-231km; Soyuz 3, 179-252km." ↑ Hall, Rex D. & Shyler, David J. (2003); Soyuz, A Universal Spacecraft; Springer/Praxis, Berlin; ISBN 1-85233-657-9. p. 421: "[Beregovoy] tried, but failed, to dock the craft with the unmanned Soyuz 2...."
↑ Clark (1988). p. 50.: "With Soyuz 3, the Soviet manned programme regained its confidence, and its success may have encouraged the Soviets to consider a manned flight around the Moon in December 1968....[O]verall it [Soyuz 3] represented a successful return to manned space missions after a break of eighteen months." ↑ New York Times, January 24, 1969; "Gunman Attacks Car in Kremlin, 2 Wounded": "A fifth astronaut, Major Gen. Georgi T. Beregevoi, who orbited the earth last October, was nicked by flying glass." ↑ New York Times; July 15, 1969; "Borman wins medal for Apollo 8 voyage": "Major General Georgi T. Beregevoi was awarded the Yuri Gagarin gold space medal for his flight in Soyuz 3 on October 26–30, 1968, in which he carried out docking maneuvers with Soyuz 2." ↑ FAI: Fédération Aéronautique Internationale Archived 2010-08-10 at the Wayback Machine (2010): see The Yuri A. Gagarin Gold Medal Archived 2007-10-13 at the Wayback Machine (retrieves Sept. 2010).